There are no photos with those IDs or post 14328 does not have any attached images! 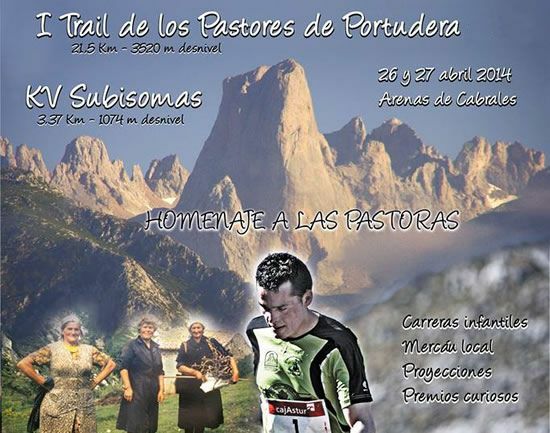 This trail runs through the Sierra de Portudera, in the heart of Picos de Europa, with the intention of recovering the traditional paths of the shepherds. You will pass through the main Mayadas and Meadows. It will start with a strong climb to the ports and then travel 12 km. above 1.000 meters, very vertical technical descent and arrival at Arenas de Cabrales with an urban route of 1.000 m.
The start of the trail will be from Arenas de Cabrales to the 10.00 on Sunday 27 in April. The 15.00 will start the children's tests from 4 to 18 years in all categories, free registration that includes trophy to the participants of the tests. This year among the many new things that there will be one of them will be the walking with the same route as the trail and will cross the traditional paths of Portudera's shepherds with 21.500 meters and 3.520 of total unevenness, it will be non-competitive and will leave the public park of Arenas de Cabrales on Sunday 27 April at 8.00 hours. The price of the march will be 10 € federated and 14 € not federated; the registration includes commemorative shirt and espicha.